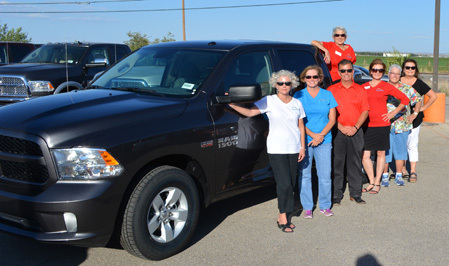 Members of Altrusa International of Artesia pose with the hole-in-one prize for their upcoming golf tournament, alongside the prize truck’s donor, Tate Branch. They are, from left, Linda Yates, Paula Menefee, Sue Pemberton (in truck), Branch, Sue Chiodini, Connie McIntire and Carolyn Christian. The Altrusa Club will hold its 16th annual golf tournament at 9 a.m. Saturday, Oct. 7, at the Artesia Country Club. To register, contact Juan Jimenez at the pro shop, 746-6732. Individual entry fee is $30, plus cart and greens fees, and mulligans will be available for $5 at check-in.